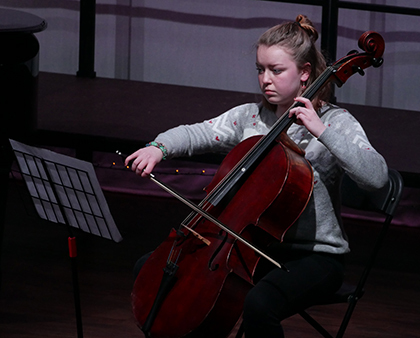 The Sixth Form College, Solihull annual Christmas Concert took place this week, as staff, students, parents and guests joined together to get into the festive spirit. As well as the traditional Christmas carols, the concert was a celebration of the talents of our A level Music students. There were group and solo performances on guitar, flute, violin, trombone, piano and vocal performances too. Student band ‘The Afterparty’ were there to perform “Treasure” by Bruno Mars, while the College Choir, which consists of both staff and students sang several festive songs. There are photos from the Concert up on the College Facebook page. The next music concert takes place on Wednesday 21 March (7.00pm), when the Easter Concert takes place. There is also a Drama Showcase on Monday 19 & Tuesday 20 March (7.00pm) and a Dance Showcase on Thursday 22 March (7.00pm). Email the Marketing Office for more information.